alaTest ha raccolto ed analizzato 74 recensioni su Harman/Kardon AVR 2600. La media della valutazione per questo prodotto è 3.8/5, confrontata con la media della valutazione di 4.1/5 per altri prodotti. Abbiamo analizzato differenti valutazioni di esperti ed utenti, età del prodotto ed altri elementi. A confronto con altri prodotti, Harman/Kardon AVR 2600 ha ottenuto un alaScore™ complessivo di 83/100 = qualità Molto buono. Four HDMI inputs; solid graphical user interface; analog video upconversion; 3D-compatible (with firmware update); 7.1 analog inputs. Lackluster audio performance; auto-setup was inaccurate in our test environment; missing advanced HDMI features like audio return channel and standby pass-through; no out-of-the-box iPod connectivity. The Harman Kardon AVR 2600 is a handsome 7.1 audiovisual receiver with a great GUI, but it's hard to recommend with its high price and comparatively lackluster performance. 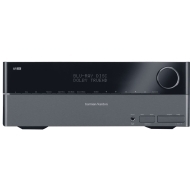 The audio from audio-only CDs, DVD-Audio Discs, SACDs, and Blu-ray disc soundtracks, was clean and distinct, making the AVR2600 more than suitable for both extensive music listening and home theater use. The best looking receiver with good sound quality when it works. A big step up from my five year old JVC with no HDMI ports. Beeping noises from speakers and two HDMI ports broken. High Current ultrawide-bandwidth amplifier sections, which generate 65 watts for each of the receiver's seven channels. 7.1 with Dolby Volume, Dolby Laboratories' latest sound-processing technology which I think is exclusive to Harmon Kardon. I have not found any yet but even though I am only using 2 HDMI, SAT PVR and PS3 I would have liked to future proof with 5 or 6 imputs. Firmware Upgrade made my receiver an expensive paperweight. I bought this receiver on 2/25/2012 so naturally the warranty has expired. By eight months. Harman Kardon was nice enough to offer assistance in the form of locating a local service center so it could be repaired at my expense. I own a sony 7.1 now. It's outside of NewEgg's RMA/Returns period (obviously), so I'll have to put my faith in the warranty claim I just sent in to HK. Spending this much on a good piece of equipment, I expected more. Guess this was my first and last piece of HK equipment. I am not happy with this system at all. I guess when I ordered this system, I had really high hopes. Least I knew, I was in for a huge surprise once plugged in.